Want to know more about the book that started the craze? Need to know what the sequel is or what other books are available? This page will tell you about the books in the Divergent trilogy series. Review: This book is a real page turner. Do not plan to get any sleep once you start reading this book! It starts out just a little slow, but by the time you get to chapter 6, you won't be able to put it down. If you enjoyed books like the Hunger Games or the Percy Jackson series, you will enjoy this series as well. This is a very short eBook that takes the knife throwing scene from the Divergent book and retells it from the character Four's point of view. If you are a big fan of Tobias "Four" Eaton, you will most likely enjoy Free Four. Most of the reviews for this short book are positive and the consensus is that people would like to read more books that have to do with Four and what he has gone through. The only negative reviews say that people are upset that it's only a short book. The description clearly states that it is only a retelling of one scene, so as long as you are prepared for a short read (thus the small price tag), you should be happy with this purchase. - I want to read Free Four, but I don't have a Kindle! Did you know that you can download a free Kindle app for your computer, smartphone, tablet, etc.? Click here to download a free Kindle app. If you are wondering what the book Insurgent is about, I'm not going to tell you. That is because I strongly believe that you should read Divergent (followed by Free Four if you'd like to) prior to reading Insurgent. If you liked the Divergent book, you will like Insurgent. This book is excellent. The downside to reading Insurgent is that once you finish, you will catch "Divergent Book 3" fever like the rest of us and you won't be able to wait until the final book of the trilogy is released (which will be in the fall of 2013). Are you ready to find out what happens to your favorite characters from this series? 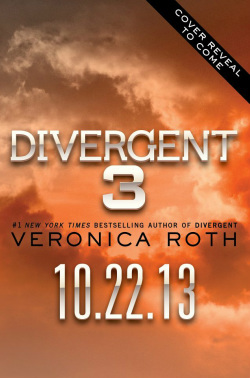 The third book in the Divergent series by Veronica Roth will be released in the fall on October 22, 2013. Did you know you can pre-order the book right now from Amazon? The link at the right will send you to Amazon.com where you can buy Divergent book 3! Book three of Divergent is the final book of the series and is much anticipated by all of Veronica Roth's loyal fans. What do you think will happen in the final book in the Divergent trilogy? Take the poll below to vote on what faction symbol you think will be on the final version of the cover.